It traces its origin to the Kaliñga – Magadha region. The classic treatise of Indian dance, Natya Shastra, refers to it as Odra-Magadhi. It was primarily developed in the state of Odisha (Oḍiśā), in eastern India. It is the oldest surviving dance form of India on the basis of archaeological evidences. The 1st century BCE bas-reliefs in the hills of Udaygiri (near Bhubaneswar) testify to its antiquity. Like all traditional knowledge which was passed down under the guru-śiṣya paraṁparā, oḍiśī too was almost destroyed during the rule of the East-India Company which extended into the British Raj. Fortunately, it survived and has been reconstructed since India gained independence in 1947.
chauka (literally square): based upon the basic square stance which symbolises Lord Jagannāth (Kṛṣṇa). This dance is characterized by various Bhaṅga (Stance), which involves stamping of the foot and striking various postures as seen in Indian sculptures. The common Bhaṅga are Bhaṅga, Abhaṅga, Atibhaṅga and Tribhaṅga. The history of Odissi dance has been traced to an early sculptures found in the Ranigumpha caves at Udaygiri (Odisha), dating to the 2nd century BCE. 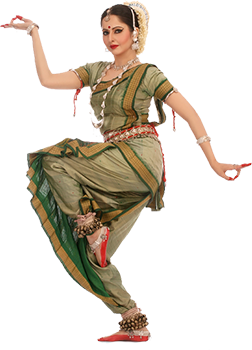 Odissi appears to be the oldest classical dance rooted in rituals and tradition. In fact, the Natya Shastra refers to Odra-Magadhi as one of the Vrittis and Odra refers to Odisha. The first clear picture of Odissi dance is found in the Manchapuri cave in Udayagiri which was carved during the time of emperor Kharavela. Flanked by two queens, emperor Kharavela was watching a dance recital where a damsel was performing a dance in front of the court along with the company of female instrumentalists. Thus, Odissi can be traced back to its origin as secular dance. Later it got attached with the temple culture of Odisha. Starting with the rituals of Jagannath temple in Puri it was regularly performed in Shaivite, Vaishnavite and Sakta temples in Odisha. An inscription is found where it was engraved that a Devadasi Karpursri’s attachment to Buddhist monastery, where she was performing along with her mother and grandmother. It proves that Odissi first originated as a court dance. Later, it was performed in all religious places of Jainism as well as Buddhist monasteries. 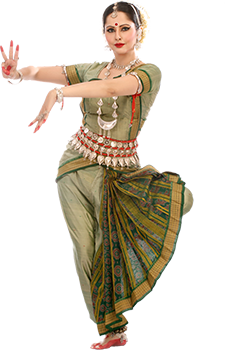 Odissi was initially performed in the temples as a religious offering by the Maharis who dedicated their lives in the services of God. It has the closest resemblance with sculptures of the Indian temples.